The celebration of Jesus' birth and his manifestation as the Son of God come in a pair of seasons with common characteristics. Underlying the two feasts of Christmas and Epiphany is the central proclamation of Christianity: the dying and rising of Jesus. Recovery of this earliest level of meaning can help us rescue Christmas from a limited emphasis on the birth of a baby; for that birth is of ultimate importance only because of the saving event of his death and resurrection. The period of Christmas and Epiphany has three primary days and themes: Christmas, or the Nativity of Christ (December 25th); Epiphany, or the manifestation of Christ to the Gentiles (January 6th); and the First Sunday after Epiphany; the Baptism of Christ. Other celebrations came to be associated with this time as well. The three days following December 25th commemorate Stephen, the first martyr; John, the disciple closest to Jesus; and the Holy Innocents, the children Herod ordered slain in Bethlehem in his vain attempt to destroy the Christ. The biblical account of Jesus' naming at his circumcision, on the eighth day after his birth – in obedience to Old Testament law – gives us the Feast of the Holy Name of Our Lord Jesus Christ on January 1st. The significance of his name (in Hebrew, Yeshua, which means "Yahweh saves") is that it reveals his nature and his ministry. The weeks after Epiphany, other events in Jesus' ministry are celebrated. These events reveal him as God's son and help us explore more deeply the unlimited extent of his love and our role – as the members of his Body – in revealing him to the world. The liturgical texts for this period are very expressive of its meaning and embody many of the symbols, both biblical and cultural, which came to be part of the season. 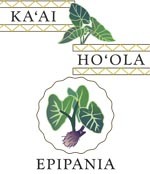 Ka 'ai ho'ola means the bread that gives life; here it is represented by kalo (taro), the most esteemed basic Hawaiian food.